This National Association of State Budget Officers (NASBO) report, supported by a grant from the John D. and Catherine T. MacArthur Foundation, highlights and discusses lessons learned by budget officers during the recent recession. States turned to a variety of actions to stabilize state budgets in this challenging and uncertain fiscal environment. States used a number of fiscal management tools such as rainy day funds, prior year ending balances, across-the-board and targeted spending cuts, revenue measures and tax increases, and one-time federal resources to avert draconian budget reductions. 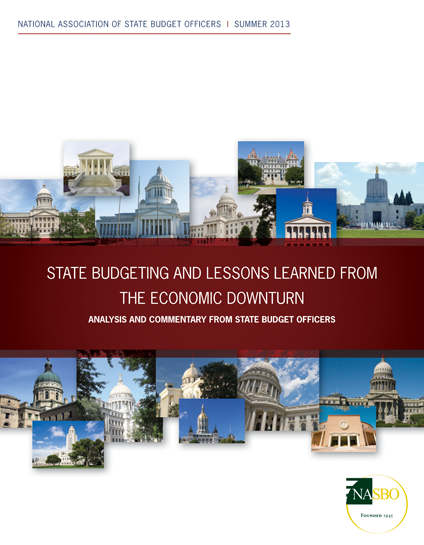 This report integrates budget officer commentary, state examples and fiscal trend analysis to provide a better understanding of state budget actions taken during the recession and what lessons were learned. The recommendations and findings in this report are designed to help limit public service disruptions in future recessions by improving budgetary planning and preparedness, enhancing the effectiveness of federal aid to states and highlighting sound budgeting and fiscal administration practices.